Can you feel the love in the air? With February, the month of desire, love, and passion, one can feel the spirit of affection. But who says, this day can only be celebrated with your romantic partner? This V-day think outside the box and begin with a fascinating new tradition of celebrating this heyday with your special ones. If you haven’t found your significant other, here is how you can make the most of this day. Your pet is your best supporter and your biggest fan. If you think getting warm hugs from your companion is as good as it can get, then think again because no one gives better hugs than these little bundle of fur. So, this V-Day makes sure to spend some quality time with your loyal friend who will follow you anywhere rather than somebody else. You can enjoy blissful picnic lunches with your pet at V Resorts Mahua Bagh Murud or can lay back and have a relaxing time while you stay at V Resorts Oaktel Boomerang Goa. Go on a lazy stroll along the shores, and get some fantastic Instagram worthy clicks with your pet. If ‘Purani Jeans Aur Guitar’ has ever topped your list of favorite songs or ‘Dil Chahta Hai’ is still your favorite Bollywood movie, then this is the time to re-live it. With a regular 9 to 5 job and lazy weekends, it has become almost impossible to spend time with your college pals. This V-day catches up with your buddies and show them that nothing has changed. Plan a vacation or a quick holiday to unwind, re-live and rejuvenate your soul with the same old gossips and endless cracking of jokes. You can stay with us V Resorts Lonavala where you can enjoy a candlelight dinner by the pool. You can also go cycling with your buddies and live through again some old memories. Have an unadulterated experience with the mountains while you stay with us at V Resorts Sattal. 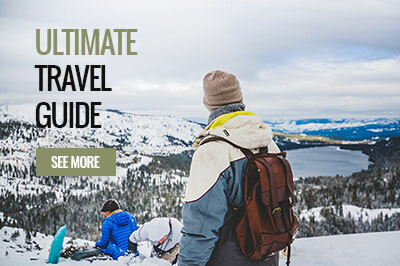 What could a better way to reconnect with your friends than trekking on snow covered mountains! If you are married and have kids, you are probably one of those couples who believe that V-Day is no longer of value. Well, that is so not true. Even as a parent, you should try to make the most of this day with your family. In the jam-packed schedule, parents and especially fathers do not get enough time to spend with their kids. So this Valentine’s instead of trying to fix them with a babysitter, rather plan a quick weekend with them. Stay with us at V Resorts Chambal Paradise, and experience our fantastic bush dinners under the sky. You can take your kids to Crocodile Safari or Lion Safari and hear them squeal in joy! If your kids are fond of mountains, you can stay at V Resorts Nature’s Heaven Koti which is surrounded by snow-capped s mountains. Let your youngsters enjoy some adventurous sports like mountain climbing, trekking or horse-riding! Ever got inspired by the Bollywood movie ‘Queen’? Well, this movie has given some excellent travel goals to people of all ages. So, make this Valentine all about yourself. Gift yourself a memorable vacation and show some love to yourself. This V-day stay with us at V Resorts Royal Palace McLeodganj and enjoy some adventurous ventures like trekking, mountaineering or maybe camping. Also, don’t forget to buy little souvenirs for yourself. If you love to lose yourself in mesmerizing views, you can stay at V Resorts Rhodo Retreat Ranikhet which is again an ideal spot to spend some quality time in your company. So, who is going to be your valentine this year?